Amazing Alex is a puzzle game by Rovio Entertainment Ltd for iPhone, iPad, and iTouch. Rovio are the creators of the iOS sensation Angry Birds. If you haven’t heard of Angry Birds by now I’d highly suggest you check your pulse. The game took the world by storm and won the hearts and minds of children and adults alike. Once the people at Rovio felt they had sufficiently covered every possible major holiday and seasonal remake of Angry Birds it became clear that it was about time (past due, in fact) for a new game. 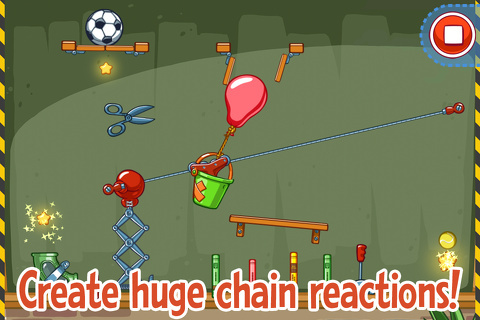 Enter Amazing Alex: the latest original puzzle game by Rovio. You know those big complicated machines a person with too much time on his hands might make where there’s a bunch of chain reactions that carries out a simple task at the end? Like a chain of dominoes that pushes a ball down a ramp and flings a rock from a catapult to a wind up a toy car that pulls a string which powers a fan that blows over an action figure….and the chain continues until your cat’s bowl gets filled with food or your blinds open up, etc.? Doc Brown had one that cooked him breakfast in Back to the Future and Pee-wee Herman had one in Pee-wee’s Big Adventure which…..cooked him breakfast. In case you’re wondering these machines are called Rube Goldberg machines and despite what pop culture tells us they are not limited to the most important meal of the day. The point is, Amazing Alex is a puzzle game where you are given a stash of items to set up a Rube Goldberg-esque chain reaction to accomplish your goals. The goal usually involves getting a ball to a certain area, like into a basket. Spread throughout the stage are three stars which can also be collected for a perfect performance. It adds a good degree of difficulty, since oftentimes clearing the level might be simple enough while getting all three stars offers the true challenge. The game starts off nice and easy to give you an idea of how things work. Armed with not much more than a few wooden ramps you’ll quickly yawn your way through the first handful of levels until seemingly out of nowhere things start to get serious. Before you know it you’ve got tubes, buckets, scissors, and much more to set up intricate chain reactions in hopes of accomplishing your goals. Is the game as amazing as the name suggests? Maybe not, but it is still a fun game which offers some challenging puzzles to solve. It is available for $0.99 in the iTunes store. 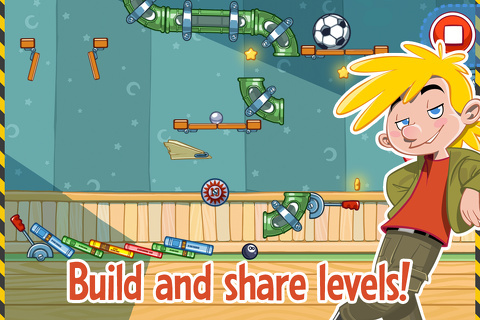 AppSafari review of Amazing Alex was written by Neema Akhtar on October 3rd, 2012 and categorized under App Store, Games, Puzzler. Page viewed 3856 times, 1 so far today. Need help on using these apps? Please read the Help Page.